Jeep is a name that’s synonymous with off-road utility. The brand is known for making capable vehicles that can dominate any path. The 2020 Gladiator pickup is going to be no different. The original Gladiator was discontinued in 1988. Jeep stopped making pickup trucks altogether in 1992. The brand-new Gladiator is a return to form for Jeep. The 2020 Jeep Gladiator is going to be a great option for drivers who want impressive performance, off-road capability, and superb hauling power. 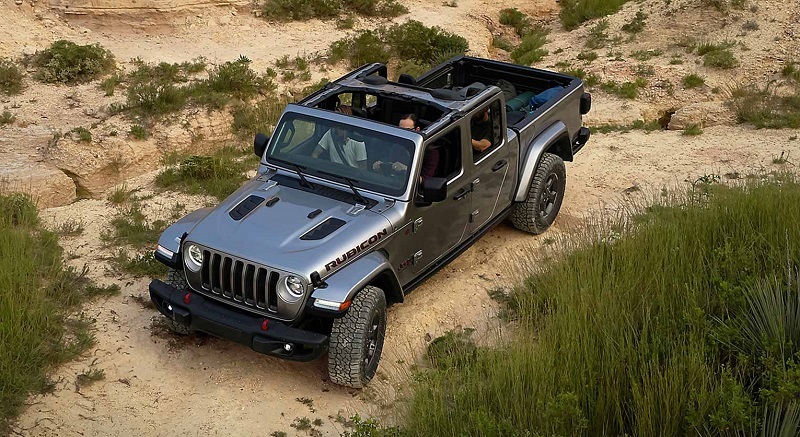 When it’s released, you’re sure to find the new Gladiator at Wabash Jeep. You can stop by today or check out our Indiana Dealer Review to learn more about what’s to come. We’re proudly serving Wabash Kokomo Fort Wayne areas. The 2020 Jeep Gladiator takes many elements from the current Wrangler. It has a boxy body that’s built to be tough. It also some of Jeep’s iconic design features, such as the round headlights and seven-slot grille. However, the new Gladiator is about 31 inches longer to make room for the pickup bed. It also has a wheelbase that’s approximately 19.4 inches longer than the Wrangler. The Gladiator will be available in four different trim levels. They include the Sport, Sport S, Overland, and Rubicon. Each trim level has unique features, such as LED headlights or modified fender flares. The pickup will also be available with four different roofs. You can get a black vinyl soft top, premium fabric soft top, a black three-piece hard top, and a colored three-piece hard top. The two latter options have removable panels so that you can customize your riding experience. 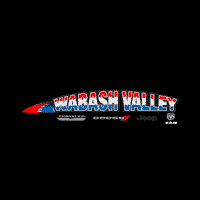 We invite you to visit us at Wabash Jeep to learn more. We’re an established Indiana Jeep dealership that’s pleased to be serving Wabash Kokomo Fort Wayne drivers. The Jeep Gladiator has enough room for five people to sit comfortably. It will be available with sleek leather-trimmed seats. Even with its large cargo bed, Jeep has included various storage options inside the cabin. In addition to door pockets and a large glovebox compartment, the rear seats have lockable storage underneath. In the front, a large infotainment screen can keep you connected during your drives. The standard option includes a 5-inch touch screen display. 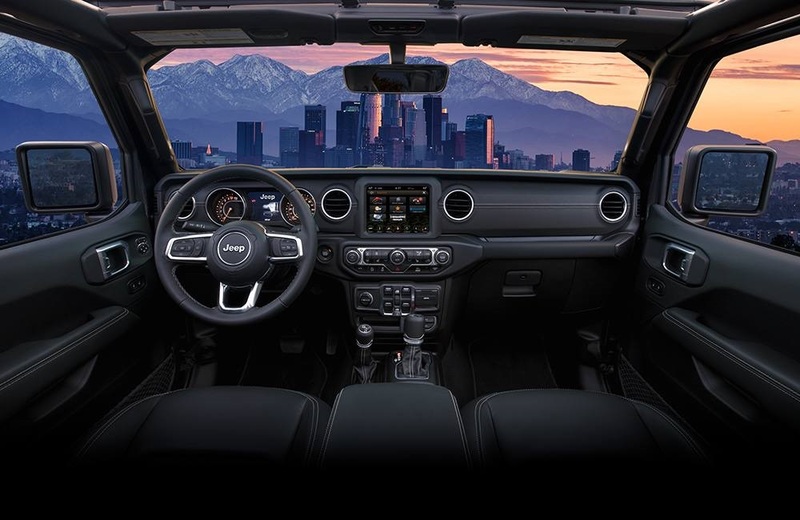 However, Jeep is also offering the UConnect 4C Nav system. It has an 8.4-inch display, built-in navigation, and satellite radio capabilities. It’s also compatible with Apple CarPlay and Android Auto. It lets you take advantage of some popular streaming services, make hands-free calls, and use your preferred virtual voice assistant. One of the most unique features that are going to be available is a removable BlueTooth speaker. It sits in the back of the cabin where it stays charged. When you want to take the tunes with you, you can pop it out and go. Learn more about the features that are going to be in the new Gladiator at our Indiana Jeep Dealership. The Jeep Gladiator is poised to become one of the most durable vehicles around. Every single model is equipped with a robust all-wheel-drive system. It offers versatile performance, excelling in both low-range and high-range driving situations. Tough Dana 44 rear axles are also included. Higher trim levels offer an electronic disconnecting sway bar, FOX shocks, larger all-terrain tires, and much more. The solid build of the new Gladiator also gives it impressive hauling capabilities. It has a maximum payload of 1,600 pounds. When properly equipped, it has a maximum towing capacity of 7,650 pounds. Want to learn more about what the Jeep Gladiator will be able to do? Check out our Indiana dealer review or stop by our dealership to speak to one of our knowledgeable team members. Powering this behemoth is a robust 3.6-liter Pentastar engine. It’s a V6 engine that’s specifically built for optimal performance and efficiency. It has variable valve timing and an electronic Start-Stop system. Both of these features can provide you with all the power you need while helping you conserve fuel. In total, this engine can pump out 285 horsepower and 260 pound-foot of torque. Jeep also has plans to introduce a diesel engine option after launch. It will be a 3.0-liter turbodiesel engine. It’s estimated to provide a bit more torque than the standard engine. When it comes to transmissions, the Gladiator can come with a six-speed manual system or an eight-speed automatic system. If you want some more information about what’s going to be under the hood of the Gladiator, take a look at our Indiana dealer review. This new pickup truck will be available with some great safety features. The exact features will vary based on trim level and package. Some systems that are expected to make an appearance include Forward-Collision Warning with Active Braking and Adaptive Cruise Control. Both of these features use high-tech cameras and sensors that are discreetly installed on the body of the truck. They monitor your surroundings as you drive. With the Forward-Collision Warning system, the Gladiator will alert you to possible collisions ahead. It may also apply braking power to avoid an accident. The Adaptive Cruise Control system uses the technology to follow the flow of traffic as it slows down and speeds up. Swing by our Indiana Jeep Dealership for more information. The 2020 Jeep Gladiator is a great addition to the manufacturer’s lineup. It will offer a versatile driving experience and more functionality. Come on down to Wabash Jeep today. We’re serving Wabash Kokomo Fort Wayne drivers. We’ll be happy to answer your questions about this upcoming truck. When it hits the market, you can see it for yourself at our showroom.